USA or Australia: which country is more expensive? This comparison of travel costs between Australia and the USA examines average prices across multiple categories. Please visit each country's individual budget page for more detailed information. Should you visit the USA or Australia? Australia and the United States have many similarities, even though the U.S. is generally a more expensive place to visit. Both nations are large with a diverse set of landscapes and cultures, although the U.S. tends to be more expensive due to its lack of options for budget travelers in larger cities and a lack of public transportation compared to Australia. Australia is a large and diverse country both in its landscapes and cultures. On the coasts you'll find great beautiful beaches and big cities. In the north are tropical areas known for wildlife. And in the center are deserts, forests, and geological wonders like no place else on Earth. The Outback, the Great Barrier Reef, the Blue Mountains, Ayers Rock, Surfer's Paradise, and the Sydney Opera House are just a few of the world famous locations to see in Australia. In a similar manner, the United States also has plenty of beaches, big cities, diverse landscapes, and natural wonders. Visitors could spend weeks or even months exploring the U.S. and still not visit every area. From New York City to California, and from Florida to the great national parks in the Western states, the U.S.A. has something to offer everyone. When is the best time to visit the USA and Australia? The weather in much of the U.S. and Australia is similar, but occurs at opposite times of the year due to the fact that they are in opposite hemispheres. But generally speaking, both countries have distinct winters and summers. Also, the parts of the country that are closer to the equator are warmer year-round. The United States covers a wide variety of landscapes and climates. Travelers can really find somewhere to visit any time of the year. The southern United States and parts of California are lovely places to visit during the colder winter months, as temperatures are still fairly warm, or at least mild. Many cities also have interesting holiday decorations if you're planning to be in the country during the Christmas season. Skiing and winter sports are also popular in the mountains of both the Rockies in the west and the Appalachian range in the east. The summer months of the U.S. (June to September) can become very hot and humid in the southeast, but the northern states are often more pleasant, even during the hottest months. 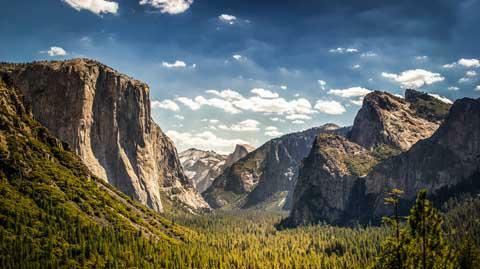 In general, the more famous national parks are the most crowded at this time. Visiting the busiest parks during the shoulder seasons is recommended if you want to avoid the crowds or if you don't have reservations. Australia, being in the southern hemisphere, experiences warm summer months from November to April, and colder winter months from May to October. However, northern Australia is relatively close to the equator, and these areas of the continent have warm weather year-round. In fact, many visitors will travel to the northern areas during the winter. At the same time, southern Australia experiences four full seasons (much like the U.S. and Europe), with colder winters and warm, humid summers. As many of Australia's larger cities are in the southeast and experience this climate, it is important to pay attention to the weather patterns. The east coast of Australia, especially further north, will be warm much of the year. The best time to visit Australia's cities and parks in the southeast is in the Spring, Summer, and Fall (avoiding June, July, and August as they are the winter months). 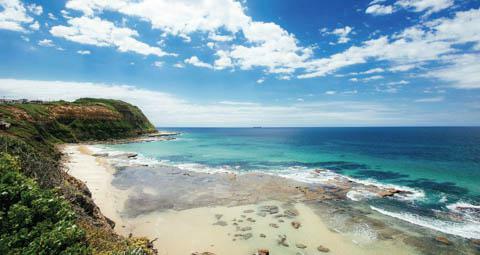 Traveling to Australia in the shoulder seasons can often lead to cheaper prices, too! Why is the USA more expensive than Australia? On average the United States is more expensive country to visit than Australia for a variety of reasons. The high cost of living and the vast size mean that transportation costs can be quite expensive. While it is possible to find great deals and cheaper prices in much of the country, the main "highlights" such as New York, California, Florida, and other famous areas are pricey. Also, if you really want to see different sections of country, flying is really your best option. The other options are to drive or take the train. Amtrak is the most well known train system, but it is limited to where it goes and prices are quite high. Many visitors from other countries are often shocked at the limited rail service between cities within the U.S. Also, in some situations, flying is cheaper than taking the train. If you want to explore the country's impressive national park network, a rental car is a must. Rental cars can be fairly cheap if you return the to the same location as you picked it up, but traveling from one location to another can often incur prices that are the same as a domestic flight. Hotels in the United States are also relatively expensive. There are very few hostels throughout the country, particularly when compared to European countries, so accommodation prices can be more than you might expect if you're on a tight budget. However, if you're driving between cities, an extensive network of budget hotels along the interstate highways is in place, so accommodation costs outside of cities can be very reasonable. But hotels in larger cities are expensive, and the lack of budget options tends to raise the overall average of travel costs. Due to a large network of budget travel options, including hostels, budget hotels, inexpensive transportation options, and low-cost fast food restaurants, it is very possible to visit Australia on a cheaper travel budget. For those travelers looking to stay in higher-end hotels, and eat in better restaurants, the travel costs can still be comparable to those in the U.S. and Europe. However, the plethora of budget options has lowered the overall travel costs for Australia, as many younger and budget-minded visitors take advantage of these low-cost options. Even families can stay in many of the hostels, so these budget options are not just for younger backpackers. What are the most expensive and cheapest cities and regions in the USA and Australia? The prices in the U.S. and in Australia can be quite diverse within each country. In the United States, for example the larger cities are some of the most expensive places to visit, but in rural areas the prices can get fairly cheap. New York City and San Francisco are notoriously expensive because of their high hotel costs and expensive restaurants. This is mainly due to high real estate prices and higher wages. Still, there are plenty cheaper hotels and a few hostels, plus affordable restaurants in these larger cities. Thus, it is possible to save some money. Free entertainment in the bigger cities can be common, and comes in the form of museums, parks, zoos, and more. This can help you keep costs down significantly while in the city. The beach resort areas of Australia, especially on the east coast, can be fairly expensive, and even very expensive in the warm summer months. The east coast beaches in Queensland from Brisbane and the Gold Coast, and north up to Cairns, are full of higher-end hotels and restaurants. But like any urban area, cheaper places can be found as there are plenty of hostels, budget hotels, and less expensive restaurants which cater to a range of budgets. The towns around the Whitsunday Islands as well as the launching points for the Great Barrier Reef can also be expensive. The big cities in the southeast of Australia can get costly, too. While budget options are available, expect prices to be generally higher than further out. 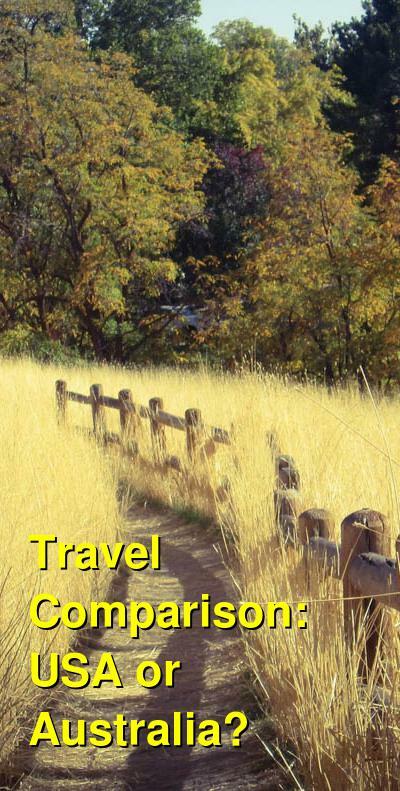 Tours, buses, and excursions into the wilderness and Outback areas of Australia can be pricey for tourists due to the great distances that must be traveled. The prices for entrance tickets and other activities in and around national parks, such as hiking and trekking, can also add to your budget. How you can save money when visiting the USA and Australia? In both countries, hotels in the center of cities are more expensive than those in the suburbs, so look for options that are a little further out. If public transportation is available this could be a much cheaper or even a more comfortable option. Many larger cities in the U.S. provide inexpensive public transportation systems that can save you money. While may cities don't have a subway or rail system, they will provide buses. Consider this when you plan your time, especially if you intend to rent a car for a portion of your trip. In some larger cities, you may have to pay to park a car either at your hotel or in a public garage. Likewise, public transportation in Australian cities is cheap and efficient, and sometimes even free in certain cities. Look for long distance bus routes between major cities if renting a car for flying is too expensive. Also, the trains in Australia can be an affordable and relaxing option, and you could see some of the beautiful countryside, too. In both the U.S. and Australia, making reservations for hotels will usually save you money. Shop around for the best prices online. Also, look for coupons and special deals, as they are frequent. Instead of staying at a hotel, consider an alternative such as camping, couch surfing, or a home stay.